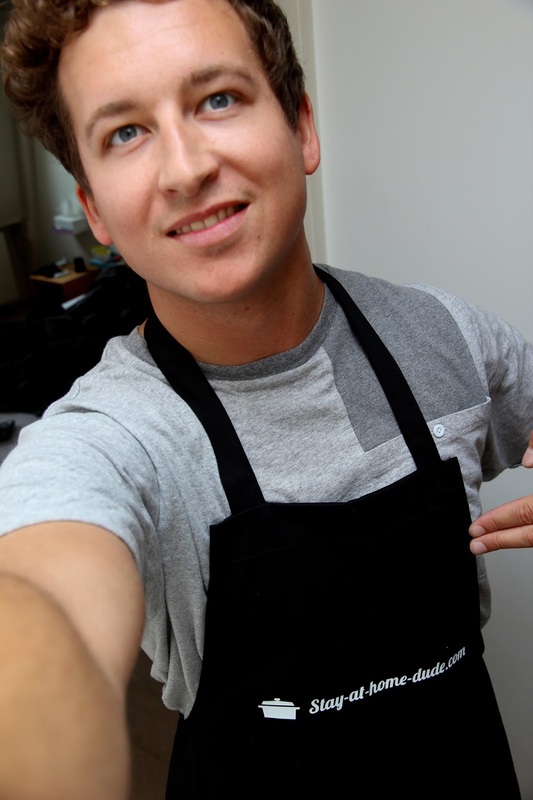 last friday my new stay-at-home-dude.com kitchen apron has arrived. The logo is flex-printed and should withstand the next cooking sessions without any problems. If you are interested in this apron you can order it in my online shop on the right side of my blog. So far it’s only available in black and white. Please contact me if you are interested in other colors. And now it’s time for another recipe – spaghetti bolognese. The perfect recipe to try out my new apron! The preparation is very easy, but the sauce has to be boiled for a long time to develop an intense flavor. – Chop the shallot, garlic and carrot and fry them briefly together with the minced meat in a big pan. Deglaze with canned tomatoes and wine. Add herbs, tomato paste and sugar. Let it boil for at least 1 hour! If the sauce becomes too dry just add wine or water. At the end spice up with salt and pepper and add cocktail tomatoes. – Cook the spaghetti in salted water “al dente” and arrange everything on a plate. Salice Salentino (red wine) fits well with the spaghetti bolognese. If you are vegetarian, then just leave out the meat. Mhmmm, wenn ich bei facebook wäre, würde ich nun den "I like Button" klicken! Kannste mal ne Portion nach Freiburg schicken?